CityShopDeals Automobiles Bangalore BangaloreAutomobiles Delhi DelhiAutomobiles Hyderabad HyderabadAutomobiles Mumbai MumbaiAutomobiles New Tata Tiago price starts at Rs 3.20 lakhs. bookings open | April 2016 Ugadi festival discount offers. New Tata Tiago price starts at Rs 3.20 lakhs. bookings open | April 2016 Ugadi festival discount offers. Its Fantastico Experience it. 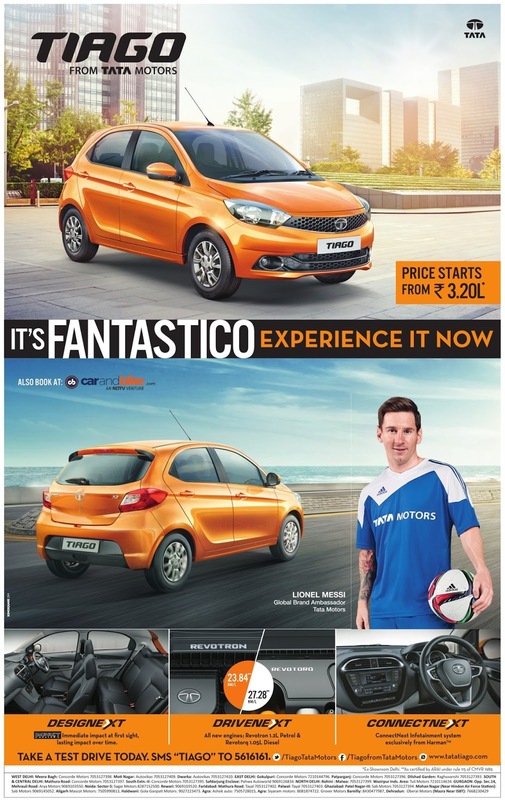 Tiago Petrol Price starts at Rs 3.20 lakhs. Take a test drive today. SMS "TIAGO" To 5616161. For more details www.tatatiago.com. Facebook: /tiagofromtatamotors. Twitter: /TiagoTataMotors. Ugadi festival offers. April 2016 discount offer.